Gargh! Ack! Argh! Dink. Plip. Smoosh. So you’re busy typing away, racing through the plot-line, when all of a sudden, there’s an interjection of sound or texture that, no matter how hard you search, you simply cannot find one that fits the occasion. What are you going to do?! It sounds like, squelch, but feels like wet velvet, is there a word? “Her hand stroked the smerchy surface…no…Her hand brushed across the squilching fibers…nah…Her skin squaalched over the mulchen fat-like deposit…” and all the while, you’re getting red underlining and suggestions for ‘real’ words. You hover over and decide whether you should: re-spell it, Ignore, Ignore all, Ask Google for Suggestions, or, Add to Dictionary. But didn’t all words have to be made up at some point in history? So why can’t you? Writers as wordsmiths have contributed so many words to the worlds languages, there are a huge amount that have fallen by the wayside, or the meaning has changed over the decades (for example, did you know that the word ‘nice’ originally meant the opposite of what we know today?!) Of course, you can’t just go writing anything you want, it has to make some kind of sense within the context of what you’re writing; besides, you might discover if you stick a bunch of consonants together, you’ve just written a pre-existing profanity in Czech or Welsh! From Irish writer, James Joyce. The OED includes tattarrattat in the sense ‘a series of short, sharp, rapping or tapping sounds’, and illustrates it with a quotation from Joyce’s Ulysses: “I knew his tattarrattat at the door.” It’s also notable for being the longest palindromic headword in the OED. Introduced by Lewis Carroll in Through the Looking Glass (1871): “He chortled in his joy.” The word is probably a blend of chuckle and snort and means ‘to laugh in a noisy, gleeful way’. In 1855, Carroll combined slimy and lithe to form the nonsense word, slithy. It conveys something slimy and distrustful. Anthony Burgess’s A Clockwork Orange is filled with inventive language. One word has become synonymous with the novel – Droog. Alex, the protagonist of the 1962 novel, uses the word Droog to refer to his three friends. Meaning ‘a young man belonging to a street gang’, the noun is an alteration of the Russian drug ‘friend’. How about a nice glass of moloko? Coined by Czech author Karel Čapek and made its first appearance in a 1920 science fiction play called R.U.R., which is short for Rossum’s Universal Robots. The word is from Czech robota meaning ‘forced labour, drudgery’. Mr Shakespeare left us over 1,700 new words according to some sources. Bedazzled, a word first used to describe the particular gleam of sunlight is now used to sell rhinestone-embellished jeans. Maybe poetry really is dead. New-fangled, as in ideas, from Loves Labours Lost. Scuffle was first used to describe the fights of the heart in Antony and Cleopatra is an example of an existing verb that Shakespeare decided could stand up just as well as a noun. “Gobblefunk” is Roald Dahl’s own language. The words are found across his literature and explain meaning when Dahl’s dream world transcends normal adjectives. Splitzwiggled means caught and Jumbly means all mixed up. Onomatopoeia; harder to spell than the words that belong in this category. But without them, where would we writers be! Kapow and Blam crop up mostly in the ‘superhero’ genre of comics, notably the earlier Batman strips. Zap was used as early as 1929 to represent a sound. It is another comic strip word; especially from ‘Buck Rogers in the Twenty-Fifth Century’. Its meaning ‘to erase electronically’ is from 1982. I love beating up bad guys, Batman. And so the world of comic strips entered a new age; children began reading them, can you believe that?! Also, the restrictions placed upon the writers forced the Mother of Invention to invent a whole new dictionary of profanities. Judge Dredd and co not only inhabit a whole new future of fatties with wheelbarrows and hi-tech stuff, but a new language developed. In case you didn’t know, Drokk most eloquently replaces the F word, Grud is instead of taking the Lord’s name in vain. Why you should play Dungeons and Dragons. Regarding the view that it promotes anti or irreligious feeling, influences teens to be drawn to commit suicide or even murder, I strongly object. If you look at statistics showing deaths as a result of ‘religious wars’, you find the numbers reach into the thousands, even millions. The Crusades alone were accountable for up to 9 million deaths (according to some sources). So it seems that war in the name of God was, and is acceptable, and by default, so are those deaths. My research led me to discover a total of 130 deaths attributed to D and D – the large majority of these were suicides. I am not taking away the fact that it is always tragic when a young person takes his or her own life- and over 90% of these were male, but looking deeper we will find that there was an emotional even mental health issue at play here. 130 is a long, long way from 9 million, so should we ask ourselves, if people played games instead of following a religion, might we not have less death on our hands? and is laughably naive to anyone today who views it today. The knee-jerk reaction must have been invented by the Americans, as anything that they cannot comprehend immediately, or that does not fit into their clean living, white picket fenced world is deemed evil. I’d like you to take a look at what others have said about playing D and D, don’t just take my word for it – after all, I’m one of those ker-razy people who play it! Playing D and D, I have learnt about so many things I did not learn in school. My knowledge base has expanded. Why? Because when you are the DM; Dungeon Master, or in my case Mistress, you are tasked with writing a scenario, or story if you will, that will not only fit the players, but challenge and entertain them, not for a couple of hours, but possibly for weeks on end! And if you veer away from the ‘traditional’, rule toting aspect; like we did, you better find something to keep your players playing. I reckon I could teach university students a thing or two about how to research. Because we moved from the original themes of dwarves, elves, wizards, dungeons and, er, dragons, we have to work with each other – collaborate – on what we all wanted to do. Don’t get me wrong, sometimes the experiment doesn’t work, but mostly, it is still fun. In fact, now I come to think of it, in over 25 years of playing (Yes, you read that correctly TWENTY FIVE YEARS), we have to my knowledge only had 3 games with dragons in them! By this, I do not mean what time and what room in the house, I am referring to game scenarios. After the traditional scenario/setting, we have played; an all Dwarven world, post-apocalyptic Mad Max style world, 12th century Damascus, World War II, the future ( space, cyberpunk, extra-terrestrials), Discworld influenced landscapes, Time Bandits influenced game, horror film influenced games, pensioners, demi-gods, siblings, postmen!! The variations go on and on. You can see how the imagination is tried and tested – excellent for an author. We’re all of us, over 50 years of age. One of us is a professional musician and educator. One supports students with learning difficulties. One of us is in the IT sector. One of us is a support in the community. And we drink tea at ‘half-time’. In conclusion, I have nothing against religion per say (you have no clue as to what belief system I follow if any) and I am deeply saddened by the death of anyone under the age of 50. But a table top role playing game is not the reason people fall by the wayside in one form or another. It encourages fair play, comradery, storytelling, imagination, patience, acceptance to name a few aspects. And its great fun! …well, that goes without saying. Posted on February 15, 2017 February 2, 2018 Categories Culture, Sci-Fi/FantasyTags advice, Craig Hallam, Dungeons and Dragons, Ethan Gilsdorf, humour, Irreligious, Nerds, role-playing games, Satanism, writing1 Comment on Why you should play Dungeons and Dragons. I made a horrible discovery – the book that I self-published a couple of years ago was set at the wrong price. I wanted it to be as affordable as possible as I was more interested in people reading it than making money. I found that after the initial set-up at £3.65, Sticks & Stones was suddenly showing as £22! After a couple of e-mails to the people at Create Space and Amazon, it has been amended. So, if you’re interested, please pop along to Amazon to purchase this little gem at the correct price. The lesson to be learnt here (for me) is don’t leave anything to chance – and do check how your ‘baby’ is doing once sent out into the world, don’t just abandon it! Is there a right way and a wrong way to go about writing fiction? http://www.copyblogger.com/creative-writing-blogs-2011/ which has 10 examples of other peoples blogs; very different styles, just find what suits you. Today I made a diagram explaining how I, and probably most of us, go about our writing process. …then, when you’ve gone around more times than a partner at a wife swap convention, you get a new idea! Hey! The original one isn’t complete yet, my barely developed disciplined brain says. And I begin again. Sound familiar? Then like me, you need to get a grip on yourself!!!! 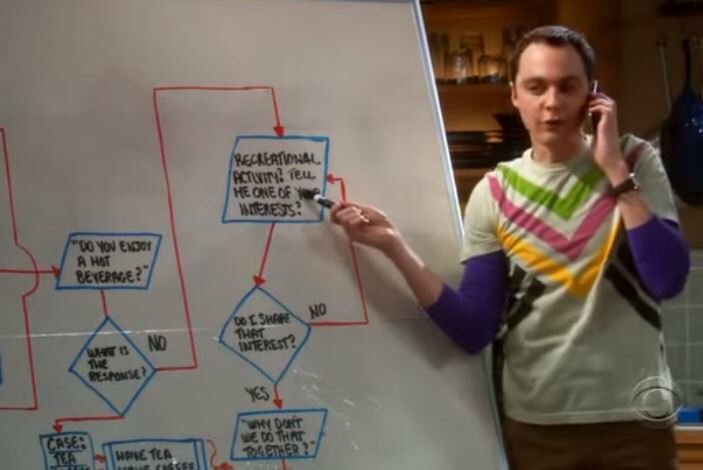 Sheldon Cooper gets stuck in an infinite loop. …or else, find your own version of Howard Wolowitz!